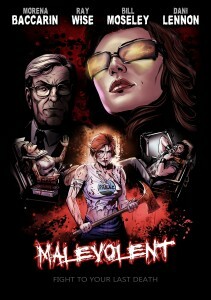 Coverage Ink Films is embarking on an animated horror film entitled Malevolent and it has cast Morena Baccarin (Homeland), Ray Wise and Bill Moseley for leading roles. Morena Baccarin has been cast as Gamemaster, an otherworldly entity who entraps hapless humans into diabolical conflicts while her species gambles on the outcome. Bill Moseley, meanwhile, stars as Pavel, Cyrus twisted henchman who is still quite the charmer (or so he believes) despite a terrible disfiguring accident. And Dani Lennon portrays the films heroine Miriam, Cyruss beleaguered activist daughter, trying her best to cope despite the damage done by growing up with a sociopath. Jason Axinn (Starpocalypse) directs the upcoming animated feature, which is now in production. The film is expected to arrive in 2015.